Cuba became a hot spot for the Kennedy administration for two reasons during the early 1960s. 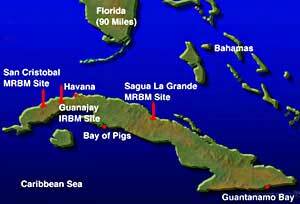 The failed Bay of Pigs invasion in 1961 was an attempt to incite a popular uprising against Fidel Castro. One year later, the Cuban Missile Crisis saw Kennedy demand an end to Russia's plan to store nuclear arms just 90 miles form U.S. soil. The Cold War raged on in the 1960s. President Kennedy faced a confident Soviet Union and a sleeping giant in the People's Republic of China. Fears of communist expansion plagued American foreign policy in places as distant as Vietnam and as close as Cuba. Like his predecessors, Kennedy made containment his chief foreign policy goal. Abandoning Dwight Eisenhower's heavy reliance on nuclear deterrence, Kennedy expanded defense spending. The United States needed a "flexible response" capability. To Kennedy, this meant a variety of military options depending upon the specific conditions. Conventional forces were upgraded. Included in this program was the establishment of special forces units similar to the Green Berets. Despite the expense, Kennedy believed communism was a menace that required maximal preparation. One of Kennedy's most popular foreign policy initiatives was the Peace Corps. Led by Sargent Shriver, this program allowed Americans to volunteer two years of service to a developing nation. Applicants would be placed based upon their particular skill sets. English teachers would be placed where the learning of the language was needed. Entrepreneurs trained local merchants how to maximize profits. Doctors and nurses were needed anywhere. Kennedy thought the program was a win-win proposition. Third World nations received much needed assistance. The United States promoted goodwill around the world. Countries that received Peace Corps volunteers might be less likely to submit to a communist revolution. American participants obtained experiences that shaped well-rounded, worldly citizens. John F. Kennedy's stirring address to the people of West Berlin in 1963 illustrated that the U.S. was committed to working for freedom throughout the region and the world. 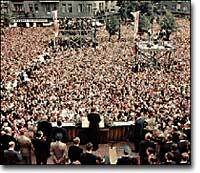 Kennedy ended his speech by stating: "Ich bin ein Berliner" (I am a citizen of Berlin). Relations with Latin America had gone sour since Franklin Roosevelt's Good Neighbor Policy. Latin American nations complained bitterly about United States support of dictatorial military regimes. They pointed out that no large Marshall Plan was designed for Latin America. In that spirit, Kennedy proposed the Alliance for Progress program. 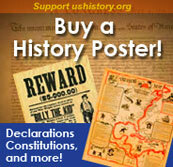 Development funds were granted to nations of the Western Hemisphere who were dedicated to fighting communism. After Kennedy's death, funds for the Alliance for Progress were largely diverted to Vietnam, however. In 1961, the citizens of West Berlin felt completely isolated when the Soviet Union built the Berlin Wall around the city. Kennedy visited West Berlin in the summer of 1963 to allay their fears. In an attempt to show solidarity between West Berlin and the United States, Kennedy ended his rousing speech with the infamous words: "Ich bin ein Berliner." In essence, Kennedy was saying, "I am a citizen of West Berlin." The visit and the speech endeared him to the people of West Berlin and all of Western Europe. Kennedy's greatest foreign policy failure and greatest foreign policy success both involved one nation — Cuba. In 1961, CIA-trained Cuban exiles landed in Cuba at the Bay of Pigs, hoping to ignite a popular uprising that would oust Fidel Castro from power. When the revolution failed to occur, Castro's troops moved in. The exiles believed air support would come from the United States, but Kennedy refused. Many of the rebels were shot, and the rest were arrested. The incident was an embarrassment to the United States and a great victory for Fidel Castro. In October 1962, the United States learned that the Soviet Union was about to deploy nuclear missiles in Cuba. Kennedy found this unacceptable. He ordered a naval "quarantine" of Cuba and ordered Soviet leader Nikita Khrushchev to turn his missile-carrying boats back to the USSR. Any Soviet attempt to penetrate the American blockade would be met with an immediate military response. The world watched this dangerous game of nuclear chicken unfold. Finally, Khrushchev acceded to Kennedy's demands, and the world remained safe from global confrontation. The Cuban Missile Crisis marked the closest the United States and the Soviet Union came to direct confrontation in the entire Cold War. The National Security Archive at The George Washington University went to a lot of trouble to enhance the understanding of the Cuban Missile Crisis. Visit the "Introduction" to learn how declassified information changed the understanding of the crisis, and learn the frightening reasons why we were on the brink of nuclear war. The "Chronology" is replete with links and provides comprehensive context to the crisis. Don't miss the "Photographs" that show aerial photos of Soviet missile bases in Cuba, and images of key people and events. Consider this a superior research resource. After the socialist revolution in Cuba in 1959, the U.S. worried that the fate of other Latin American countries would follow suit. This page has President Kennedy's "Alliance for Progress" address of 1961, an agreement by the U.S. to offer aid to enhance the quality of life and security in Latin America, in exchange for social and political reforms. Kennedy offers ten main points to his key initiative in Latin America. It's another great speech by Kennedy, but the implementation of the policy is another story. Texas A&M provides the text of President Kennedy's address concerning the Nuclear Test Ban Treaty of 1963. This first international nuclear treaty, enabled by improved verification abilities, banned nuclear testing in the atmosphere, in space, and under water. Guess where nuclear testing was still allowed? The U.S. attempted to assassinate Cuba's Fidel Castro at least 8 times from 1960-65. The United States CIA was supporting guerrilla groups and conducting sabotage operations in Cuba before Kennedy took office. Did John F. Kennedy really flub his line and say "I am a jelly doughnut" in German instead of "I am a citizen of Berlin" during his 1963 address to West Berlin?